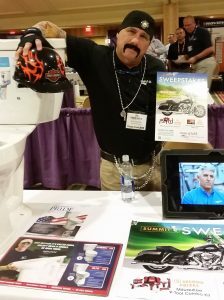 Mansfield Regional Sales Manager Ken Kraynak knows what it takes to get the most out of a trade show experience — you have to go “all in” with enthusiasm to generate attention for your booth. That’s just what Ken did at a recent Sandusky Show when he donned a biker outfit (complete with fake tattoos and facial hair!) to promote the Harley-Davidson prize for the 2016 Summit Sweepstakes: Road to Freedom. Tip #1: Create excitement in your booth. Think out-of-the-box and find a way to lure people into your booth. Get them to stay by offering a drawing they have to sign up for, a selfie station where they can get a picture of themselves sitting on a Mansfield “throne” or participate in a game. Tip #2: Pump up your team. Remember that a high energy level during the entire show is critical. Schedule breaks often to booth workers so they’re “fresh” with every visitor. Tip #3: Stay focused. This means keeping iPhones and cell phones put away while working the booth. Don’t allow booth workers to get distracted … keep your attention on show visitors. Tip #4: Walk away with contacts. Plan out in advance how you’re going to capture contact information and qualify potential leads. Are you relying on hot lead sheets, a raffle form or card swipes? Or are you asking for business cards or for people to provide contact information in exchange for giveaways? Tip #5: Plan the flow of your booth. No one likes to get “captured” in a booth with no way out. Create an open flowing booth space and then station workers throughout the booth rather than being clumped together or creating the dreaded “wall of workers” that attendees can’t break through to see your product!